Parking at the Port of Tampa gives you plenty of options. Whether you want to park right at your ship (and pay a little more) or save some serious cash by parking a little further away (and taking a free shuttle), you’re covered. Best of all, Tampa has several options that compete and run parking specials, so you’re rate may even be lower than what we have here. Port of Tampa Official Parking: The port offers plenty of parking right at the cruise terminals. In total, you have your choice of about 3,500 spots, two-thirds of which are covered garage parking. Just as with any other port, you will pay for the convenience of parking right next to the cruise ship. Parking is $15 per day. That runs a hefty $105 for a 7-day cruise. Parking for oversized vehicles (RVs, etc.) is $30 per day. Valet parking is also available. The port offers online pre-pay for its lots, which we suggest as it gives you one less thing to worry about once you reach the port. 241 Car Services: This parking lot is almost as close as the official Port of Tampa parking, but at just a fraction of the cost. Rates run just $8 per day. The main parking lot is lighted, fenced, and offers overnight security. And even though the lot is very close to the port, a shuttle is offered. We do recommend booking online ahead of time due to the lot’s small size. Park 4 Cruise — This small lot offers you cruise parking for just $9 a day — considerably less than the $15 you’ll pay just down the road at the official port lots. Located just across Channelside Drive from Terminal #6, Park 4 Cruise is gated and lit, offers 24 hour security, and a shuttle to your terminal. Parktologists: This is another lot that is very close to the port, yet offers a heavy discount compared to the official Port of Tampa lots. The lot sits just a couple of blocks north of the port. The daily rate is currently a very reasonable $9 per day and includes a free shuttle and 24-hour surveillance. Like most other lots, we recommend booking online ahead of time to lock in your rate and spot. There is also a parking garage — the SkyHouse Garage — located within about three blocks of the port. It also runs just $7 per day. Because of the cheap rate, 717’s lots fill up quickly. You definitely want to book ahead of time to secure your spot. Individual Hotels: If you are staying in the Fort Lauderdale area, contact your hotel to see if they will allow you to park your car for the length of your cruise. 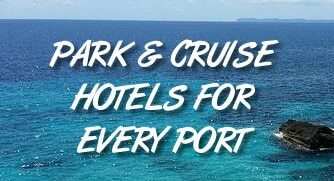 Many hotels cater to cruisers and have special daily parking rates and free shuttles. Here is a list of hotels in the area with cruise parking. Getting to the Port of Tampa — Transportation options from airports and the area to the cruise port. Everything you need to know to get to the port and start your vacation. Tampa Park and Cruise Hotels — If you plan to stay in the area the night before your cruise, look at this list of hotels that offer cruise parking with a one-night stay.